Two pitchers with polar-opposite Opening Day experiences last week meet Tuesday night in San Diego when the Arizona Diamondbacks and Padres clash in the second game of a three-game set. Arizona’s Zack Greinke gave up seven runs on seven hits and two walks with three strikeouts in 3 2/3 innings at Dodger Stadium . . . and four of the seven hits were home runs. 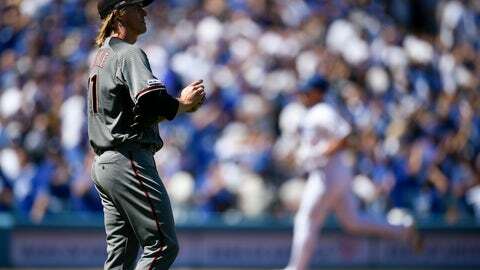 It marked the second time in four seasons that Greinke has given up seven runs on Opening Day. Meanwhile, left-hander Eric Lauer, who at 23 years and 298 days old was the second-youngest Opening Day starter in Padres’ history, held the San Francisco Giants scoreless on four hits and a walk with three strikeouts over six innings in San Diego. Naturally, the post-opener moods of both pitchers were also poles apart. Greinke’s ERA: 17.19. Lauer’s ERA: 0.00. Now it comes to the second outing of the season for each in the second game of the series. The Diamondbacks pounded the Padres 10-3 in Monday night’s opener. Greinke, 35, will be making the 416th start of his 15-season Major League career Tuesday night and he has a 187-119 record with a 3.40 earned run average. He needs three strikeouts Tuesday night to tie Jamie Moyer (2,441) for 43rd on the all-time list of strikeout leaders. The 6-foot-2, 200-pound right-hander is an ace. Lauer is a sophomore among Major League pitchers. Last Thursday was the 6-foot-3, 228-pound Lauer’s 24th Major League start. He has a 7-7 record with a 4.12 ERA – a number that fell by almost a quarter-of-a-run on Opening Day. Lauer’s Major League career spans 118 innings. Lauer did lead the Major Leagues with 10 pickoffs last season and had another in the season opener. Lauer was one of three first-round picks the Padres had in the 2016 draft. He was the 25th overall pick out of Kent State, where he had a 0.69 ERA – the lowest mark in the NCAA in more than three decades — with a 10-2 record as a junior. Lauer faced the Diamondbacks twice as a rookie with some mixed results. He was 1-0 with a 0.79 ERA over 11 1/3 innings in the two starts. But Arizona hitters batted .311 against Lauer, who had a 1.50 WHIP against the Diamondbacks. Lauer now has a 3-4 record in 12 starts at Petco Park with a 3.99 ERA in 58 2/3 innings. Aside from a 2013 run-in with Carlos Quentin that resulted in a fractured collarbone, Greinke has had excellent results against the Padres and at Petco Park. Greinke has an 11-2 career record against the Padres with a 2.20 ERA in 22 career starts. Last season, he was 1-0 with a 2.77 ERA in two starts. Greinke has made 13 starts at Petco Park, where he has a 5-2 record and a 1.96 ERA in 87 1/3 innings.